Isa bey mosque is one of the best and important example which reflects the end of the Seljuk Empire period in late 14 C A.D. In addition, this mosque bears the imprint of Umayyad mosque in Damascus in which is one of the Islamic centers for scientists and scholars. The marble and tiles here make almost a harmonial visiual feast those who want to visit. The ruler , Aydinoglu Isa bey, conducted to the architect in order to reflect the splendeur and strength of the empire so the architect made a great effort to create such a beauty. Isa bey mosque is an announcement against to the power of Ephesus and the creativity of Artemis as if saying I am also here centuries after. 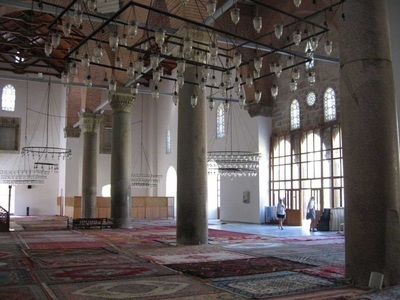 Isa bey mosque is in Selçuk down town and it is easy to reach. It is between the ruins of Artemis temple and basilica of St. John the evangelist. It is on the right hand side from Izmir road and next to the St. John basilica. 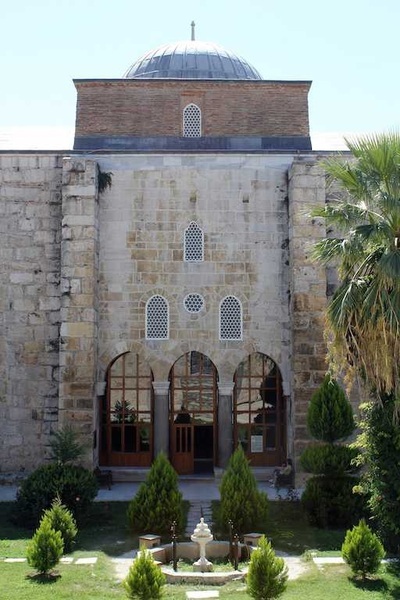 According to the inscription on the west gate, the mosque was built by the architect Ali Dımaski from Damascus in 1375 for the request of the sultan Aydınoglu Isa bey. 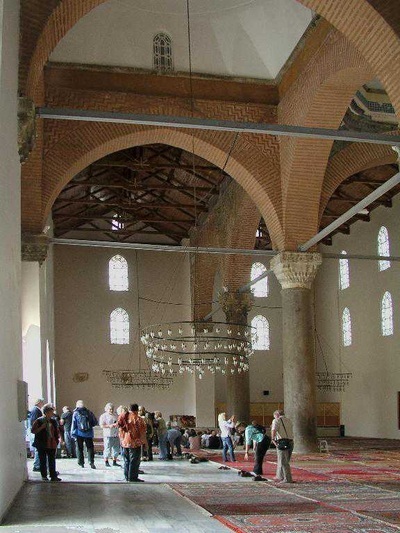 One of the famous Turkish travelers called Evliya Çelebi gives us a detailed information about this mosque published in 17 th century in his book. When the Ottoman empire began losing its power the mosque was left in ruins at the end of the 19th century and it was used as a caravanserail where the caravans used to stop for spending the night with their camels. During this period, the mosque was altered several times and the changes inside were made. For instance, the altar was dismantled in the south wall for opening a gate. Various architectural pieces with inscriptions from esatern and northestern gates have been removed. 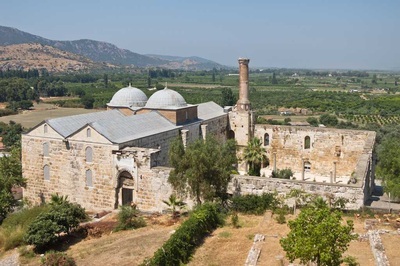 In 1895, Austrians cleaned the mosque and the courtyard was arranged in the framework of the activities carried out in Ephesus by the Austrian Archaeological Institute. It was renovated in 1934 first and it was restored several times till 1988 to do the final restoration. Later it was open to pray and to visit. 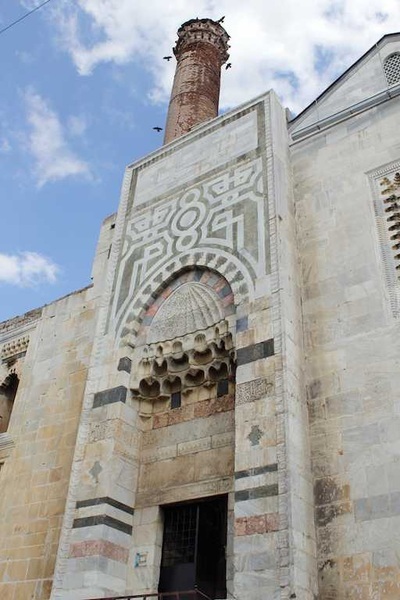 Isa bey mosques was founded on the western slope of Ayasuluk hill overlooking the area and it has big harem with two naves and it consists of a large courtyard. The mosque was built on a non-symmetrical plan and has two doors on both sides. The western gate is really nice decorated with geometrical shapes and ephitats. Western walls are covered with marble while the others are made of cut stone. The facade, the window sills and the dome of the mosque were adorned with unique Seljuks tiles dated 14th C AD. The mosque’s two minarets rising on the eastern and western gates were destroyed in the earthquakes happened in several times. 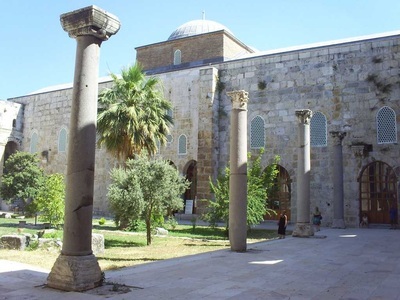 Today you can see a broken minaret on the southern part of the mosque with the stork nest on.There are twelve columns in the courtyard which are brought from Artemis temple to be used in the construction. A small pool was added to the mosque later. In the courtyard of the mosque alongside the walls someone can realize some tombstones with ephitats and symbols on them. When he approaches, he can try to understand what they symbolize and what they tell . The tombstones in the courtyard are in two categories ; The black ones in Arabic reflects the Seljuk periods with Kufic letters and the white marble ones in Turkish-Arabic-Persian mixed known as Ottoman language. The black ones dated 14th C AD and written on some holy verses from Koran. They also tell us some famous words of prophet Mohammed as advice. The white marble tombstones with different turbans are trying to tell to the vistiors they are male, the tomstones with flowers are female so anybody can easily identify the sexes. If anyone knows the language, He is also given the detailed information about their occupations, their feelings, their titles, their families and so on. All of them are endengared tombstones of two great empires ; Seljuk and Ottoman. Reading the written calligraphy and decrypting the symbols on the Turkish tombstones is not only a getting information about the past but also understanding their lifestyles and desires.